In a move that could revolutionise the way we buy groceries, Amazon has opened a supermarket with no checkout operators or self-service tills. Long queues formed outside the Amazon Go store in Seattle before it opened its doors to the public on Monday. It uses hundreds of ceiling-mounted cameras and electronic sensors to identify each customer and track the items they select. Then they are free to put any of the sandwiches, salads, drinks and biscuits on the shelves straight into their shopping bags. With the help of sensors on the shelves, items are added to customers' Amazon Go account as they pick them up - and delete any they put back. An electronic receipt is issued as they exit. The store opened to employees of the online retail giant in December 2016 and had been expected to allow the public in more quickly. But there were some teething problems with correctly identifying shoppers of similar body types - and children moving items to the wrong places on shelves, according to an Amazon insider. 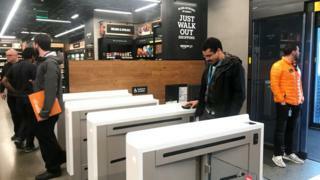 Gianna Puerini, head of Amazon Go, said the store had operated well during the test phase: "This technology didn't exist - it was really advancing the state of the art of computer vision and machine learning." Grab-and-go shopping has been the "future of retail" for some time now. But now Amazon believes its time has come - or at least that it is ready for real-world testing. They're calling it "Just walk out" and while they won't spill the beans on just how it works, they say it uses "computer vision, deep learning algorithms and sensor fusion, much like you'd find in a self-driving car". You scan a QR code as you enter. After that, your phone can go back in your pocket. Hundreds of infra-red ceiling cameras have been trained (with Amazon employees as guinea pigs) over the past year to differentiate between customers as they move around the store, and between items for sale, even those with similar appearances, such as different flavours of the same canned drink. There are weight sensors on the shelves to help indicate if an item has been taken or put back. And some items carry a visual dot code, like a bar code, to help cameras identify them. Amazon isn't offering any information on how accurate the system is. However, one journalist attempted to shoplift some cans of soft drink - but the system spotted it and added them on his bill. Amazon has not said if it will be opening more Go stores, which are separate from the Whole Foods chain that it bought last year for $13.7bn (£10.7bn). As yet the company has no plans to introduce the technology to the hundreds of Whole Foods stores. However, retailers know that the faster customers can make their purchases, the more likely they are to return. Making the dreaded supermarket queue a thing of the past will give any retailer a huge advantage over its competitors. The Seattle store is not Amazon's first foray into bricks and mortar retailing. In 2015 the firm opened its first physical bookshop, also in Seattle where the company is based. There are now 13 in the US - as well as dozens of temporary pop-up outlets. In its third quarter results in October, Amazon for the first time put a figure on the revenues generated by its physical stores: $1.28bn. Yet almost all of that was generated by Whole Foods. While its stores may not yet be moneyspinners, analysts have said Amazon is using them to raise brand awareness and promote its Prime membership scheme. Prime members pay online prices at its bookstores, for example, while non-members are charged the cover price. Brian Olsavsky, Amazon chief financial officer, recently hinted that rivals should expect more Amazon shops in the months and years ahead. "You will see more expansion from us - it's still early, so those plans will develop over time," he said in October.